Engineered wood fiber is the most cost effective surfacing solution for your playground. We use only IPEMA certified wood fiber that is specifically made for playgrounds and tested to meet and exceed fall heights of equipment. 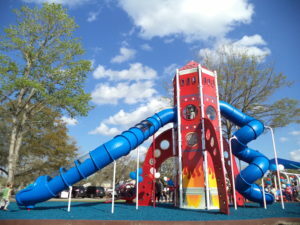 We typically maintain the depth of wood fiber and provide access into the play area by utilizing our Recycled Plastic Border Timbers and Accessible Ramp. 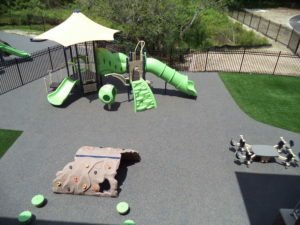 Rubber Mulch is a great alternative to using engineered wood fiber. It is cost effective and also utilizes a border to maintain its depth. Rubber mulch exhibits excellent impact attenuating properties to protect children from falls. It also comes in fun colors! 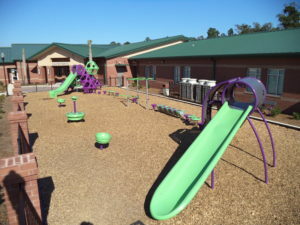 Poured rubber surfaces are ideal for meeting applicable safety and accessibility standards while providing the ability to customize your playground surface.